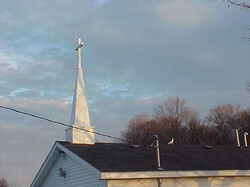 On November 6, 2006 at 2:30 pm, our church family raised its new steeple over our new church building. 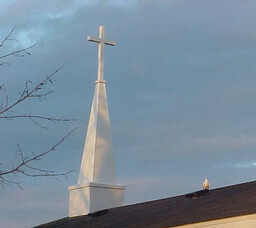 At 4:30 pm on this same day a pure white dove descended out of the heavens and lighted upon our church building. This special visitor sent to us by God is a wonderful confirmation of God’s blessing upon our ministry. On the evening prior to this spectacular event our pastor preached a message about “the sound of a going” (2 Sam 5:24) and in his closing prayer, he prayed for a moving of the Holy Spirit upon the church. 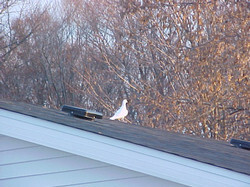 Can this dove be a sign that God has answered our pastor’s prayer? We believe that this beautiful white dove lighting upon our church on this special steeple raising day was no coincidence. Can this dove be a sign that God is “well pleased”? Our church is ready and now the gospel message must sound forth! This special messenger has brought hope under his wings. Hope that God will do a great work in our church. In the Power of the Holy Spirit our church will move forward in reaching our community with the saving gospel of Jesus Christ.